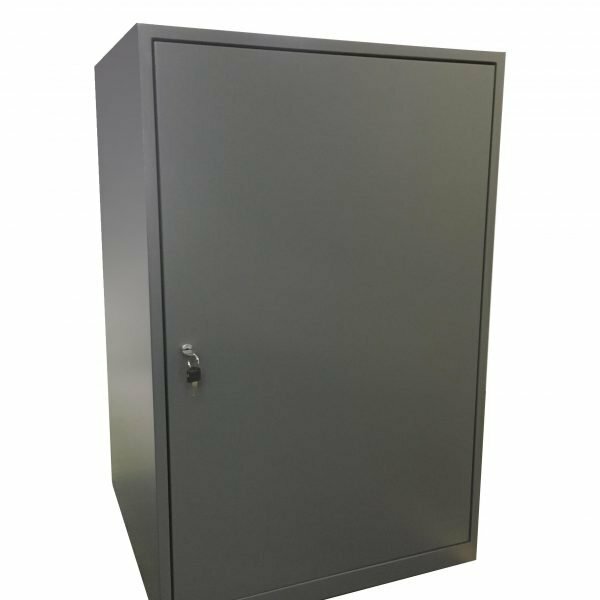 Glass Cabinet Hire is our most popular service, as the glass cabinets are glass bonded edge to edge, with battery powered lighting meaning that you can place the cabinets anywhere including the center of the room. The plinths underneath the glass cabinet have lockable doors, which mean that the inside of the plinth can be used as storage space during events. Our glass cabinet hire portfolio ranges from 1 glass case provided for The Ritz for a corporate meeting, to 19 glass cases at the International Jewellery Show or an entire Exhibition Supplied such as The Watch Show with 39 Glass Cases. We have a large customer base and we would be more than happy to help with your glass display rental needs. 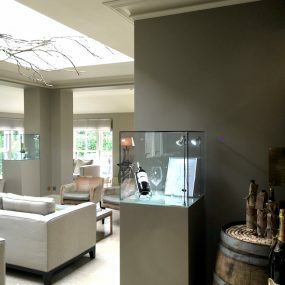 Our glass cabinet hire portfolio ranges from 1 glass case provided for The Ritz for a corporate meeting, to 19 glass cases at the International Jewellery Show or an entire Exhibition Supplied such as The Watch Show with 39 Glass Cases. 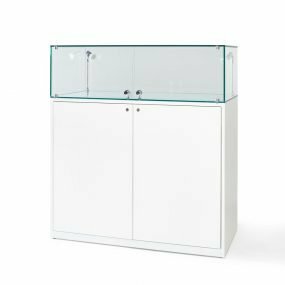 We have a large customer base and we would be more than happy to help with your glass display rental needs.All our cabinets are supplied on a plinth which come in standard colours black or white. We would be more than happy to arrange for you a bespoke colour to match your company branding or logos to achieve the same personalised effect. The display plinths have internal storage, which means that valuable items can be stored inside during the exhibition hours. Know exactly what you want? Fill in this form and we'll send you a quote. The cabinets are hired UK wide and have regular trips into London to the major exhibition centres, including Earls Court, Olympia, The Excel Centre and in Birmingham the NEC. Our delivery team will deliver to all areas of the country, and we provide an out of hours service such as weekend setup and de-installation of exhibitions. The lighting fittings are polished chrome, and the light bulbs are LED 3000k Spectrum. Different spectrums of lighting can be provided in the cabinet depending on what it is you are displaying. Please discuss with our office team the type of light you wish to achieve in the cabinets. Lighting is battery powered which means that you do not need to purchase electricity power for your stand. Our batteries provide 49 hours of on time and should you need more than this time, we can provide a charger or indeed two batteries for you to change them mid-show. Loushelou and Jaquet Droz show below our lit glass display cabinets (both empty and filled) at exhibitions which were at The Saatchi Gallery and London Earls Court.